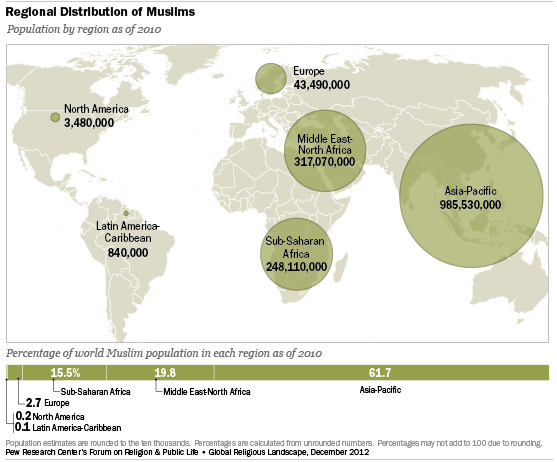 Muslims are concentrated in the Asia-Pacific region, where six-in-ten (62%) of all Muslims reside. Many Muslims also live in the Middle East and North Africa (20%) and sub-Saharan Africa (16%). The remainder of the world’s Muslim population is in Europe (3%), North America (less than 1%) and Latin America and the Caribbean (also less than 1%). Although a majority of the world’s Muslims live in Asia and the Pacific, only about one-in-four people (24%) in that region are Muslims. By contrast, the Middle East-North Africa region has an overwhelmingly Muslim population (93%), but they represent only about 20% of the world’s Muslims. Muslims also make up about three-in-ten people in sub-Saharan Africa, 6% of those who live in Europe, 1% of North Americans, and less than 1% of the population of Latin America and the Caribbean. 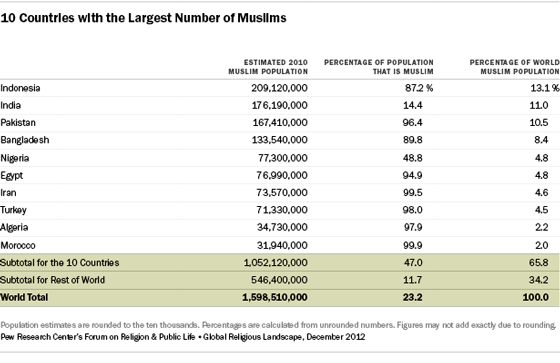 Muslims make up a majority of the population in 49 countries. Nearly three-quarters of all Muslims (73%) live in these countries. Although Muslims are a minority in India (14% of the total population), India nonetheless has one of the largest Muslim populations in the world (in raw numbers). Globally, Muslims are younger (median age of 23) than the overall global population (median age of 28). Among the five regions for which data are available, Muslims are youngest in sub-Saharan Africa (median age of 17), followed by the Middle East and North Africa (23), Asia and the Pacific (24), North America (26) and Europe (32). Muslims are younger than the general population in each of the major regions for which data are available: North America (Muslims 26 years; general population 37 years), Europe (32 vs. 40), Asia and the Pacific (24 v s. 29), sub-Saharan Africa (17 vs. 18) and the Middle East and North Africa (2 3 vs. 24). About Pew Research Center Pew Research Center is a nonpartisan fact tank that informs the public about the issues, attitudes and trends shaping America and the world. It conducts public opinion polling, demographic research, media content analysis and other empirical social science research. Pew Research Center does not take policy positions. It is a subsidiary of The Pew Charitable Trusts. Take part in our user survey! Please tell us about your experience using our site.